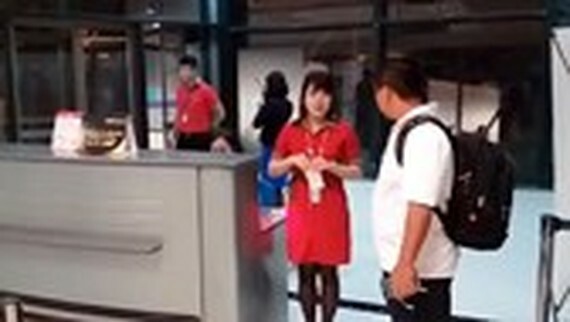 The Civil Aviation Authority of Vietnam (CAAV) has demanded low-cost carrier Vietjet to have strict discipline on a staff who had been filmed tearing a late passenger’s ticket on November 5. The Vietnamese aviation watchdog confirmed the female ground employee to have improper behavior to passenger badly affecting the aviation image and service. To avoid such things in the future, the watchdog ordered in document all carriers to provide knowledge and skills to servicemen in a bid to improve their behavior to customers as well as increase supervision to these people. It ordered the carrier to learn experience from the lesson and issue harsh penalty on the staff. Vietjet representative said that it had imposed stern discipline to the staff with inappropriate attitudes. The incident took place on November 5 on the Vietjet VJ159 flight for the Hanoi-Ho Chi Minh City route in Noi Bai International Airport. A passenger showed up in the airport 15 minute later; accordingly the staffer refused to let the man board the plane in observance of regulations meant to ensure prompt flight departure, and directed him to the following flight on the same day. However, as per the passenger’s complaint, the staff was not friendly in guiding him, making quarrel with passenger and tearing his ticket. The incident was filmed and posted on social network. Through the incident, Vietjet representative advised people to go the airport early.